We service the Rancho Cucamonga area and throughout the state of California. 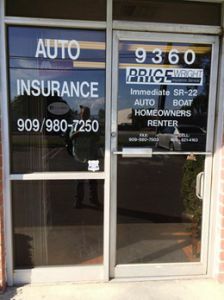 At PriceWright Insurance Services, each one of our clients is given a dedicated team of experts that work together to proficiently address all your concerns. We offer all types of Personal Insurance coverages to our clients in California including Auto Insurance, Boat & Watercraft, Condo Insurance, Flood Insurance, and Homeowners Insurance. Give one of our agents a call to save money on your Business Insurance. Some of our Commercial insurance coverages include Bonds, Business Owners Policy (BOP), Commercial Auto, Limo Insurance, and Commercial Property. Just give us a quick call today at 909-980-7250 or Submit one of our quick online quote forms - with the help of our dedicated business partners; we conveniently offer an entire solution for all your insurance and business needs.